It felt like it was going to be another one of those days. You know the type of day I am talking about. The kind of day where bites are few and far in between and when you do hook into a big fish, there is inevitably something that goes wrong. That is certainly how the day started out for me on a recent trip. I was on Watts Bar doing some drifting. The wind was calm and current was flowing at around 0.5mph. Conditions were absolutely perfect. My setup was four rods with cut skipjack which I had caught earlier in the morning. I started out drifting a ledge above where I launched and worked my way downstream following the deepest breakline while keeping my baits suspended a couple feet off bottom. Everything was going according to plan except the fish catching part. The bite was slow for the first couple hours. By slow, I mean nonexistent. I finally picked up a couple dink blues to get the skunk out. A little while later, I had a huge takedown on one of my rear rods. 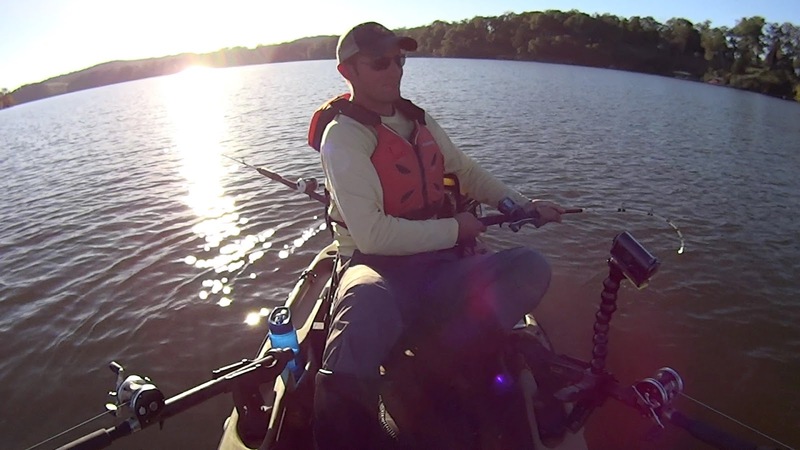 While fighting the fish, I glanced at my fish finder and noticed that it was pulling my kayak at 1.2 mph. The fish had taken a big skipjack head and was pulling hard. It felt like a solid fish. Unfortunately, for whatever reason, he didn't hook up and let the bait go. It is always frustrating when it happens but even more so on a day when the action is so limited. I continued to drift my way downstream along the ledge catching another small blue cat in the process. 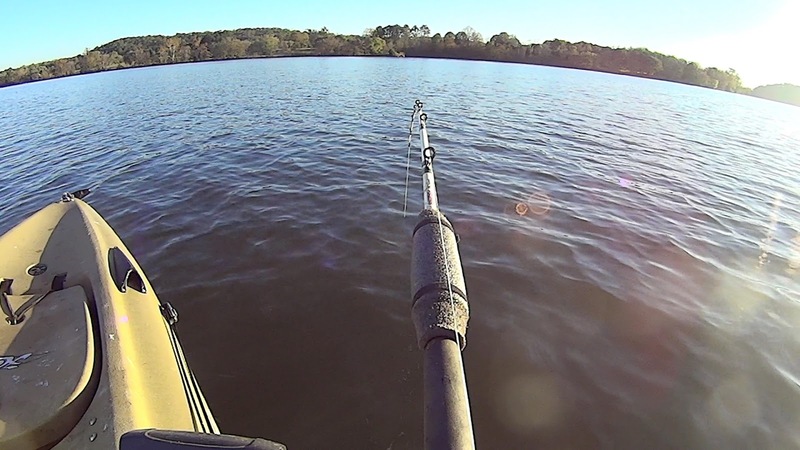 A little while later, I felt a thump and watched my rod tip just slightly bend over and sit there. This is very characteristic of a flathead bite. They will often take a suspended bait and just sit there with it. It is in these times where the amount of patience you have will often determine whether or not you end up landing the fish. If you pick up the rod too soon, you will often pull the circle hook right out of its mouth. 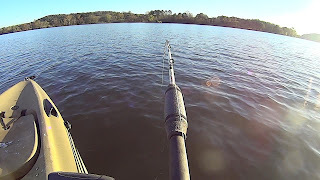 I have found it is best to just leave the rod in the holder and let the fish make the first move. After about 2 minutes, the rod took a hard dive and I picked up. I knew right away it was a solid fish. Then he was gone. I had jumped the gun too soon and didn't get a good hookset. 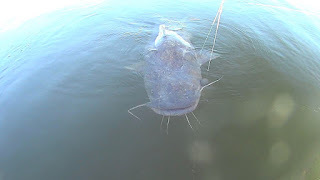 As frustrated as I was after losing the first big fish, it was compounded even further after losing what I know was a big flathead. At that point, I had succumbed to the thought that it was just going to be one of those days that I referenced in the opening paragraph. Little did I know my luck was about to change. Exactly 2 minutes and 46 seconds later according to the video footage, I felt another thump and watched my rod tip barely bend over. This time I was absolutely determined not to touch my rod until I knew the fish was swimming with the bait. It was an excruciatingly long wait but after almost 3 minutes, the fish decided to run. I picked up the rod and the battle was on. The fish put up an awesome fight while tangling another one of my lines in the process. 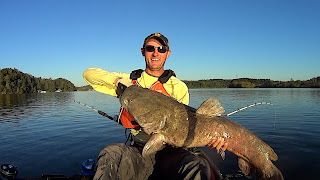 In the end, I was able to land what I think is the heaviest flathead that I have caught up to this point. I never weigh them so it is impossible to know for sure but he was a definitely a monster. After getting some quick shots, the beast was released to go get even bigger for the next time we meet. Needless to say, my frustrations from earlier in the day were quickly washed away. It turned out to be another great day of kayak catfishing on the Tennessee River. fishing tips. If you learn effective and fundamental fishing tips to your child from childhood i think they will be a great angler.